05 ISSUE TWO This issue has been a long time coming, but at last it is finished and in your hands. I hope that it’s been worth the wait—and I pray that issue three will come out in a much more timely fashion! The response to our first issue has been tremendous. Judging from the outpouring of interest from readers and new subscribers, the field has been hungry for this sort of magazine for a long time. I hope that this second issue, and the many more I have in store for you, will satisfy your cravings. I only wish I could produce more issues more often! With the help and support of a few more advertisers, I am confident that we will reach that goal. That being said, I want to remind everyone that this is a very small magazine. This is not produced by 20 people, or a committee of advisors, or a focus group. It’s basically me sitting in front of a computer and collaborating with a handful of freelance writers. In many ways this is a fanzine with very high production values, made purely out of our love for the art of illustration. While it would be nice to sell 100,000 copies, my goal is not for ILLUSTRATION to be the Communication Arts of the illustration field. My goal is to produce a beautiful and inspirational magazine featuring in-depth stories and interviews with some of my favorite artists—the best and most talented illustrators working in the field today. With any luck, a lot of you will want to come along for the ride. I’ve been waiting all of my life to see a magazine like this, so I am confident that more than a few of you will want to be on board. That being said, I would also like to invite you to get involved in helping to spread the word about this magazine. If you are a student, encourage your school to subscribe. Mention us to your local librarian. Ask your local newsstand to carry the magazine. Everything you can do to spread the word is invaluable to us. Many thanks to all of the contributors, advertisers, and subscribers out there who are helping to make this magazine a success. Your enthusiasm is appreciated! 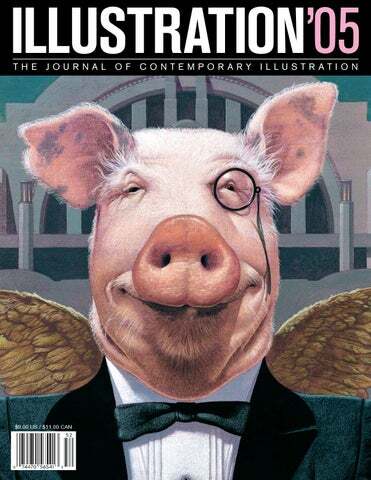 ILLUSTRATION ’05 Issue Two, Fall 2005. © 2005 by ILLUSTRATION ’05 (ISSN 1555-9866) All text and artwork is © the respective creators or publishers. None of the material in this publication may be reproduced in any form without the written permission of ILLUSTRATION ’05, or the respective copyright holders. All of the images utilized herein are reproduced for historical and scholarly purposes only. Every effort has been made to provide factually accurate information. ILLUSTRATION ’05 is published four times per year. Single copies may be purchased for $9 postage paid in the U.S. Four-issue subscriptions are available for $36 postage paid in the U.S. Make checks or money orders payable to ILLUSTRATION MAGAZINE. For advertising information and rates please contact Daniel Zimmer at 314-577-6768, or email Dan@illo.us. Our address is: ILLUSTRATION ’05, 3640 Russell Blvd., St. Louis, MO 63110. We cannot accept orders over the telephone. Fe, New Mexico. Chris is the chairman of the Museum Committee of the Society of Illustrators of New York, and serves on the Board of the Illustrators’ Partnership of America—a nonprofit organization developed to educate illustrators about business, copyright, and licensing issues. He is also a founder of The Illustration Growers of America, a non-profit committee charged with the responsibilities of creating an ad campaign to promote commissioned illustration, giving individual illustrators a promotional voice to compete against stock art in the marketplace. (www.illustrationgrowers.org) While some artists keep their methods and techniques to themselves like secret ingredients in a special recipe, Payne demonstrates the subtle nuances of his craft willingly. He has taught at the Brookhaven Community College, Dallas, Texas; East Texas State University, Commerce, Texas; Miami University, Oxford, Ohio; The Columbus College of Art & Design, Columbus, Ohio; and summer graduate degree sessions at Syracuse University in New York. Recently Payne was named chair of the illustration department at The Columbus College of Art & Design, the school that he commutes to from his home in Cincinnati two-and-a-half hours away where he lives with his wife, Paula, and his sons, Trevor and Evan. Payne’s style transcends standard preconceptions of the traditional caricature. His portraits have a classical, painterly quality that lends a twisted believability to the realism of his subjects. These portrait chargés (charged or heightened portraits) are so realistic that they appear more true to the person’s features and personality than any photo could ever capture. Add to this Chris’ wit, creativity, and impeccable sense of design, and you get a work of art that almost breathes with a life of its own. Truly he is every professional artist’s nightmare. Thank God he can’t leap tall buildings in a single bound too! about Carmine Infantino. He loved Infantino, but I didn’t. Then the conversation turned to how we both liked Steve Ditko. So I started hanging out and taking classes with the graphics guys. We didn’t have a specific illustration class at Miami at that time, just the graphic design class. Our teacher, Joe Cox, was a member of the Art Director’s Club in Dayton. From time to time we would go up there to hear a variety of speakers like Alan Cober. After Cober’s presentation I said to Mr. Cox, “That’s what I want to do! I don’t want to do package design. I don’t want to do annual report design—I want to do illustration.” It was in my senior year, my last semester, and Mr. Cox said, “Okay, all your assignments will be illustration assignments.” Alan Cober also talked about The Illustrators Workshop, the first one in Tarrytown, New York. I told Alan, “I’m coming. I don’t know how I’m going to get there or where I’m going to get the money, but I’m going to be there.” He said, “Great, I’ll look forward to seeing you.” I sold my guitar, my stereo, my comic book collection, my coin collection—I sold just about everything I had and then I borrowed some of the money from my father. It cost $2,500, which was a good chunk of money back then. ’05: How long were you there? CFP: About three or four weeks, so we were there a long time. Later on I believe the workshop ended up being only a two-week program. There weren’t a lot of kids just out of college there—mainly there were a lot of professionals. I remember Richard Newton, a very good illustrator, was there. I still see Bill Vann’s work but he was one of the real stars there because you could see he was a seasoned pro. He did beautiful work. Each one of his assignments was just top drawer and they blew everybody away. We had some others who were interesting characters—David Griffin from Texas was there, a couple artists from Hallmark were there, some Canadians were there, so it was a big group. As I recall there were maybe about 30 or 40 students. It was a great experience. Raphael DeSoto, Mitchell Hooks, Tom Gill, Jack Lane, and more! Robert Bonfils, Larry Admire, Men’s Adventure Art, and more! R.G. Harris, Harry Anderson, Bill Campbell, and more! W.T. Benda, Alex Schomburg, Lee Brown Coye, and more! “Oh, hi Chris. You do know that we have a three strikes and you’re out policy?” (Laughs) And I’m going, “No, you don’t understand. I’ve got to make sure that if I accept a job I’ve got to be able to do it right.” And Arthur’s saying, “I’m just kidding. I’m just kidding. Don’t worry about it—we understand.” In the end I think they appreciated the fact that if I felt I couldn’t give the job the right amount of time and energy I wasn’t going to do it. So the third time they called me was for a cover on Bill Clinton. That was my first Time cover. ’05: You’ve been doing the back covers of Reader’s Digest for several months now and they’ve certainly increased your visibility. They are very strong story-driven pieces out of a Rockwellian school of thought. As a young artist, Norman Rockwell had to have been a big influence on you—maybe not in technique or style, but certainly in how he could illustrate a narrative. CFP: I remember looking at Norman Rockwell’s work when I was in junior high school through 11th grade. In all my study I never rejected Rockwell. Who could imagine the work of Rockwell and his influence would come back and hit me full circle to where now I’m given these wonderful assignments for Reader’s Digest? ’05: “Slice of life” art. CFP: Yes, they have an American slice-of-life theme. You just can’t run away from the impact of Rockwell, though. I’m doing everything I can to not let him influence me. I have to take my look at contemporary culture and give it my best shot. Rockwell set such a standard, not only with the storytelling but also with his craftsmanship. If I don’t do my very best people will just not accept it. It cannot be mediocre because they’ve already got this torchbearer who set a standard. ’05: Do you think Rockwell went through the same thing with Leyendecker? CFP: But Leyendecker was not so much of a storyteller. They were more iconic images, and he didn’t do the full narratives. zine. So when the opportunity comes you feel like, “This has GOT to be great.” because if it’s not they’ll just say, “See, we don’t need illustration.” All of a sudden I’m no longer illustrating for my own career—now I’m illustrating for the betterment of my entire profession. It’s weird. I’m illustrating these Reader’s Digests now. Potentially, these things are seen by 20-30 million people because it’s printed in something like 14 languages. I’m sure my images aren’t on the back of the Chinese version. (Laughs) But the point is that having your work seen by 20-30 million people, the responsibility that artwork has for that magazine is huge. If I start thinking about that too much, all of a sudden I feel a pressure that I never used to feel before. If I can’t make this succeed, if each picture is not a terrific picture, I feel like I’m not just letting myself down but I’m also letting my peers down. The way this industry has evolved, you’re not seeing illustrations on the covers of magazines the way you used to and it’s unfortunate. ’05: Recently you’ve been named as chair of the illustration department at The Columbus College of Art & Design in Columbus, Ohio. Now I know you’ve been teaching there for several years, but how did the chairmanship come about? CFP: Walter King had been chair of the department for a long time. He had wanted to devote more time to his artwork. I’m still learning about this new position. First I wanted to know how we could make it work with me living in Cincinnati and the college being in Columbus. In talking with Dean Richard Ashenbrand, Stewart McKissick, and Walter, we’ve been working out the details. I don’t want people to think that the department chair is nothing more than a figurehead, and everybody else does all the work. authorship of their work is being constantly challenged. One of the biggest obstacles illustrators are facing, for that matter all artists are facing, is that oftentimes they are being forced to give up ownership of their work. If, to get a job, they have to give up the copyrights for their original creations, they also forfeit any long-term security those creations may offer them because now someone else owns them. ’05: And there’s nothing that can be done about it because there is no longer any way to protect your intellectual properties. CFP: Right. That’s going to be one of the toughest things for young people, because they’re going to be graduating from school and have college loans and bills to pay, and they need the work. There’s only going to be so much work available to them and there really isn’t a means available to them to protect themselves from this type of thing. The companies that deal with these things will have them sign contracts that will be long-lasting contracts. There are contracts out there where people will ask you not only for the work that you do for them at that moment but the contract will grant them rights to own all the work you do for them from that point on. Some contracts will even grant them the rights to work that you’ve done for them in the past. ’05: Like Condé Nast? CFP: Let’s put it this way… I won’t sign the Condé Nast contract. I’m not sure if the recent Condé Nast contract has a grandfather clause in it, but one of their recent contracts has a clause that if you did a work for one of their publications, then they own the rights for any work that you do for any of their other publications. So if you do something for Cosmopolitan, that contract carries over into Travel and Leisure—you don’t have a separate contract for that magazine. and Jagermeister… and I’m going “Oh, God.” As it turned out, they just wanted to see how it was coming and bring me some food. ’05: By that time how much was done? CFP: It had come a long way. ’05: I’ve seen you—you work really fast. CFP: Yeah, pretty quick. So I had some pizza and one beer and I had pictures taken with Bunny and Alex Bostick, one of the students there, and there were four or five of us, and we all had a brush and we were standing around the painting and it looked like we were all working on it at the same time. I called Time magazine and said, “You can send a courier here about 3:30 in the morning to the hotel. I continued working and I literally finished it at about 3:15. So I called a number to confirm the courier and he soon arrived at the hotel lobby and I asked him, “Do you have a receipt for the art?” and he looked at me and said, “A receipt?” and I said, “Yeah, a receipt.” And he said, “No, I really don’t have anything.” I just looked at him and said, “I’m giving this to a total stranger? I don’t know who you are.” This wasn’t FedEx, he wasn’t in a uniform, so I had him call his superior and we talked. I got a piece of paper with their names on it, gave him the artwork, and went upstairs to bed around 4 a.m.. I got a 10 o’clock wakeup call, loaded my stuff in my car, and drove back to Cincinnati, and low-and-behold, Monday it’s on the cover of Time magazine. Gotta love it. It was wild. This is what drives me nuts about stock. We were able to tailormake a very specific image to tell a very specific story to an audience. You take a hoop, set it on fire, put it at any height, and an illustrator will do everything they can to jump right through it. It’s not just me; it’s illustrators performing miracles daily. You can’t tell me that stock is better. You can pile all the images of a stock house as high as you like but they still won’t be better than one original thought. ’05: At times I’ve heard you define modern illustration as “art under the circumstances.” Would you please elaborate? CFP: Fine art tends to place fewer restraints, fewer restrictions on artists, while illustration, by its nature, is a vehicle of communication. The root of the word illustration is “to make clear.” What we do as illustrators is to produce artwork intended for use by people for people. The reality of modern illustration is that we live in a competitive, fast-paced world with increased demands and shorter deadlines. “Circumstances” can dictate the success of the illustrator and how “clearly” their art is understood. Not everything I do is perfect, but it’s as “perfect” as I can do based on the circumstances—the constraints—of that particular assignment. The one thing that has stayed consistent is that illustration was and is “popular art”—the art of the people. It is a reflection of our culture. When historians want to understand a time—a culture—they will look to illustration rather than fine art to understand the people. Because of that, it truly is a relevant and meaningful art form. ’05: All things being equal, if you didn’t have to pay a bill for the rest of your life, if you didn’t ever have to worry about money again, what type of art would you do? CFP: I don’t know. I really don’t. It’s an interesting question because there are friends of mine, like Mark English who is doing some incredible landscapes, and his son, John, who is doing some marvelous work on his own, and there’s part of me that sees what they’re doing and has some envy in what they’re doing, but then I sit down and wonder, “What would I want to paint?” I don’t have this yearning to create a new body of work. The one thing I love about illustration is that it’s constantly dealing with today’s culture—it’s a mirror of our world. I still like being an illustrator. ’05 Interview © C.F. Payne and Brian M. Kane, September 22, 2004 Brian M. Kane is the author of Hal Foster—Prince of Illustrators, and the upcoming James Bama: American Realist. He is also hard at work on a monograph on the legendary illustrator Bob Peak. Sergio Giovine by Gary Lovisi The name Sergio Giovine probably doesn’t ring a bell with you. But if you’ve heard of Jake Logan or The Gunsmith, or if you have seen either of these long-running Western paperback series in the bookstore, then you’ve seen examples of Sergio’s work. Since 1982 he has painted hundreds of paperback covers in numerous genres, and while he may not be a household name, he has been producing paperback cover art for more than 20 years. In the following article, interview, and appreciation, Sergio was kind enough to answer specific questions about himself and his work as well as talk about the current Western and Young Adult cover art fields. These are areas in which he has worked for many years, concentrating on two Western paperback series—The Gunsmith books by J.R. Roberts (pseudonym of mystery author Robert Randisi), an incredibly lengthy series of over 250 books; and the Slocum Series by Jake Logan, another series of over 300 books! For many hundreds of these covers, Sergio’s work was rendered traditionally on canvas in oil paint. Since 2000, though, Sergio—like many other illustrators—has given up paint and canvas, and he now creates all his “paintings” digitally on a computer. It is a growing trend in the business and a fundamental change in the way many paperback cover illustrations are produced. stunning recreation of a pulp crime masterpiece by Raphael DeSoto. The other was a pulp-inspired piece of a Kim Bassinger-like girl glancing behind her shoulder at a menacing guy about to pull a gun on her. The original samples no longer exist, but Sergio recreated these two paintings about five years ago. (The DeSoto-inspired painting will become the cover for a future issue of Hardboiled magazine published by Gryphon Books.) “I eventually found an artist’s rep, and he handed me a Western manuscript and two sample paintings done by some other illustrators. He indicated that no other artists in his stable wanted to do these Western covers. They were considered low-brow, pulp jobs. In the early 1980s, everyone wanted high-profile Romance assignments which received considerably more money and attention. So, being the hungry artist that I was, I grabbed the jobs—not believing at the time that these series of books would last as long as they have. I continue to do them to this day. However, I’ve done them digitally for the last three years.” In the mid-1980s Sergio was asked by the art director to move away from the pulp style and make the paintings more realistic. He says, “I believe these two paintings (done for Jake Logan #172, and another titled West Texas Plunder) best illustrates the style that exemplified the pulp style of the 40s mixed with the realism that was required on paperbacks in the 80s and 90s. It was a middle ground that required me to paint quickly using less oil paint. The Westerns were done in half a month, the other half of the month I worked on children’s trade paperbacks. Computer Generated Art Sergio also spoke about modern book cover painting and the use of computers in generating art today: “Much of the description about the working process is from artists who worked in the 50s and the 60s and that hasn’t changed until the advent of the computer. I also used photographed models and friends when collecting reference material (i.e. photos) for a painting. I’ve also considered what I’ve done to be assignments—jobs—and not fine art which will emotionally move viewers and change the world. I think that 19th Century French salon painters and their contemporaries operated with those intentions in mind. I believe art served a very different purpose then, it educated, entertained, and revolutionized society. I think motion pictures serve that function today.” Asking him about the crossover from painting to digital, and what was lost or gained, Sergio explains, “I found the experience of learning the new medium not difficult at all. I took a crash course in Photoshop here in San Francisco, and within weeks I managed to complete and submit my first digital illustration. What I did discover is what plagues everyone who uses the computer. When the hardware crashes, it can be a big problem. In my first year, two of my computers had to be replaced because of hardware problems which couldn’t be repaired. 1. Photos. After deciding on a rough composition, I gather photos from a variety of sources. Many of the photos I have collected over the years are black and white, but all of my current photos are taken in color, as this is easily modified in software. The black and white photos are tinted using the Brush tool and Color Mode in Photoshop. 2. COMPOSITION. I clip the selected photos and bring them into a single document in Photoshop. I use the Masking and Lasso tools to make selections and drag and drop the images into the document. I use the Transformation tool to adjust the size of my selections until I reach the desired scale of each item. I arrange the images into my final composition. tinue to change the shape of the mountains by adding selected sections of the mountains hidden behind the portrait, copying and pasting the additions to the right of Jakeâ&#x20AC;&#x2122;s head. Some layers are merged to decrease the file size and make it more manageable. 7. COLOR. I color tint all of the black and white photos using the Paint Brush tool at 100% Opacity in Color Mode setting. When the tinting is completed, I soften the selected areas in the images using the Blur tool at 50% pressure, gradually achieving a softer and less photographic look in the elements that compose my Illustration. I continue to refine the painted images alternating between the Airbrush and Paint Brush tools. If Cabarga’s work dances around the early animation and commercial styles of the 20s, the clip art aesthetic of the 20s–50s with a little bit of socialist realism and Pop Art thrown in once in a while, the common link is the visual melting pot of the late 1960s—and the birth of the underground comix movement which coincided with Cabarga’s youth in New York. “My father worked for as a designer for Will Eisner’s firm, American Visuals, when it was producing PS Magazine for the US Army. PS used a comic format to explain preventive maintenance to soldiers, but it wasn’t entirely comics. (Recently I ended up following in my father’s footsteps—in yet another way—by designing technical instructions. I bought a table saw, and the instructions were so lousy I got the company to hire me to redo their manual. A woodworker friend of mine said it was the only manual he’d ever seen where everything is actually explained.) “When I was 12 my father brought home some pages for PS magazine and hired me to do the color separations for $12 a month, which seemed like a fortune! From then on, I spent weekends cutting amberlith.” As for many young artists and designers, even these modest contributions to a printed piece were enough to draw him in deeper. “Oh yes, I felt pride in seeing the issues [of PS] that I’d done the color seps for. And it really set the tone for my workaholic life: friends would come over wanting to play and I’d say, ‘Sorry, I have to work.’ I spent the next 25 years or so missing parties and going out because I had deadlines. These days I have fewer deadlines, but nobody invites me to parties much anymore! “Johnny Jones in At the Dentist”, The National Lampoon, 1975. As a child Cabarga was haunted by a book he’d seen by dentist Weston Price who had traveled the world comparing the teeth of uncivilized tribesmen to those of their civilized brothers and cousins who had begun eating processed foods that wreaked havoc upon their teeth. This eventually resulted in the comic strip above. Cabarga is currently working with the Price-Pottenger Foundation to restore Weston Price’s original photographs. or you can just buy a few books. Also, I’ve learned from every editor that’s ever corrected my writing. I paid attention! That has helped me enormously. For the next few years I did a few comics here and there and basically starved, which I found amusing, since I grew up middle class and had never wanted for food in my life. I gradually gave up comics because I came to realize I wasn’t much of a story teller; The art director of the East Village Other had once suggested that what I needed was to be hit over the head and shanghaied to China, then spend two years trying to work my way home to America. This, he thought, would provide me with the experiences I’d need to have something to write about in my comics. But later, when I switched to illustration, I always felt that each picture should tell a story and indeed, I think many of my illos kind of have some scenario­—some small little situation that the viewer can sort of figure out—going on in them. “In 1975 graphic designer Mike Salisbury hired me to do some freelance paste-up for City Magazine, a new San Francisco-based magazine published by Francis Ford Coppola. Within 2 hours he promoted me to designing a section of the magazine each week. I also did regular illustrations for the magazine, so that was really my start in illustration as opposed to comics. I started to hit up all the few magazines in San Francisco at the time—Rolling Stone being notable among them—for illustration work. “I met [cartoonist] Trina Robbins in New York City when she was living with Kim Deitch. They had a daughter and by the time I got to San Francisco, shortly after they migrated there, they had split up and I got involved with Trina. At 18 I took over the fatherhood of their daughter, Casey Robbins, a relationship I’ve maintained to this day—though Trina and I broke up after six years. chooses to draw, the style itself is the message and the topic—he loses himself in the psyche of the eras he works in. It is only natural that the 50s, the era of the company man, be used to discuss industrial ethics; a modified Soviet style be used to address the world-cooperation that the USSR advocated, if by more objectionable means. And art deco be used for the Jazzera Empire state building and Manhattan Transfer—though for the band it is a bit of a misdirection. Their lineage traces more honestly to 50s than the Jazz age. What Cabarga draws is often mundane— the espionage story uses a peek though a key hole; and fast trains and tall buildings were common enough in Art Deco work—but his facility with style takes these concepts out of the range of the ordinary. Pastiche gives Cabarga’s work a surprisingly rich and subtle subtext. While it is unlikely that the typical viewer, untrained in art or design history can consciously “read” all of these choices, they do effect perception. Viewers, cast as they are on a sea of cultural detritus, can follow the currents even if they don’t always know their sources. The CyberPad is a relatively low cost stand-alone device with internal storage capability that digitally captures and stores everything you write or draw with ink on ordinary 8.5 x 11 inch paper. The digital notepad works with an electronic inking pen that feels and works as well as any other normal pen. You can write or draw naturally on any sheet of paper, and the pad captures and stores your every line at 1024 LPI resolution. Even if the thickness of papers laid on the pad are 3/4” thick, your handwritten notes can still be captured and stored in the built-in memory (32MB, about 150 digital pages), or on an optional SD memory card. And by connecting the pad to your PC or notebook via the USB port, you can use it to draw on the computer screen as you would with any other tablet. What I like about this device is the fusion of the real and the virtual. Rather than drawing on a brightly lit monitor surface, you are instead drawing directly onto real paper. Not only do you have a real sketch that you can file away, you instantly have a digital version that you can email, or bring into another image editor for further work. Eliminating the cost of a large LCD screen brings this device down to a very reasonable price, ideal for toting along on a subway ride or plane trip. (And if you forget it somewhere or leave it on a park bench, it won’t be the end of the world.) The fact that this is not a full blown laptop also means that battery life is much longer. You get 20 hours of writing time out of four AAA batteries, and 68 hours of standby time. The pen battery will last around 15 months, and there’s an LED indicator to let you know when you’re running low on power. One of the greatest things about a digital sketch pad like this is handwriting recognition. It’s so much easier to search through pages of notes by keyword. (Try doing that with your paper sketchbook!) Given the convenience and size of this pad, plus the low price and the wow factor, it’s hard to find a reason NOT to own one! This fascinating and fun package is a must-have item for anyone with an interest in the “designer toy” movement, the toys often referred to as urban vinyls. Through a series of exclusive interviews with the best toy designers in the world, this book investigates the entire process of creating a figure—from the designer’s concept and rough drawings, to the sculture and production of the toy, to the final marketing of the finished product to specialized dealers around the world. Far from the mass produced products you might find in the discount stores, these toys are more like limited edition sculptures. (With price tags to match! These toys are not cheap.) Many illustrators have made the leap into toy design, and such esteemed artists as Gary Baseman, Tim Biskup, Daniel Clowes, Todd Schorr and others have produced limited edition figures in the past few years. The 232 page book is packaged in a toy box concept, and comes with a large fold out poster covered with reproductions of scores of toys, and 36 web cards with web addresses to the 44 designers profiled in the book. Widely known for his lush and meticulous line art, Mark Schultz has been a major creative force in the comic field for over 20 years. He has been the recipient of numerous industry awards, and his most well-known creation—the award-winning comic book Xenozoic Tales—was adapted for television as the animated series Cadillacs and Dinosaurs. In addition to his own works, Mark has scripted or illustrated many other popular characters, including Superman, Flash Gordon, Tarzan, Prince Valiant and the characters of Robert E. Howard. While there have been numerous reprintings of his comics, sketches and other works throughout the years, few of these volumes have come close to matching Flesk Publication’s brilliant new collection, Mark Schultz: Various Drawings Volume 1. Building upon the success and beauty of his previous books on Joseph Clement Coll, and Franklin Booth, John Fleskes continues his line with another stunning new publication. Great care has been taken to reproduce Schultz’s original drawings as faithfully as possible, and the rigorous attention to detail shows on every page. The reproductions are so clear they almost look like original drawings. 49 preliminary sketches and numerous finished brush and ink pieces are showcased, most full page, to reveal Schultz’s complete mastery of his medium. Fans of Hannah Dundee and Schultz’s gorgeous women will be delighted with the new pieces created especially for this book. Previously unpublished images from Xenozoic Tales fill much of the volume, along with private commissions, a previously unpublished cover for SubHuman, an oversized gatefold of a breathtaking adventure scene, and some amazing pieces from his most recent projects. Artist Geoff Hunt is known to millions for his book cover paintings. His illustrations for all 21 of Patrick O’Brian’s historical novels about the British Navy during the Napoleonic Wars have brought him worldwide acclaim, and have served to launch an entirely new career as a fine artist. This wonderful new documentary enters the studio of Geoff Hunt, and explores the story from the artist’s point of view— how he was chosen to paint all of the book covers, and how he works out the details of his meticulously researched paintings. It isn’t often that we’re able to watch over the shoulder of a famous illustrator as he creates a painting, but in this video we are treated to just such a demonstration as Hunt works out the details of an elaborate nautical compositon before our very eyes. His attention to every detail is awe inspiring, and this DVD is a must for anyone interested in watching a world class painter at work. B LO GS : DRAWN! http://www.drawn.ca/ Drawn! 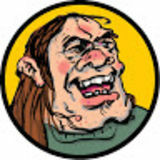 is a collaborative weblog for illustrators, artists, cartoonists, and anyone who likes to draw. ILLUSTRATION FRIDAY http://www.illustrationfriday.com A topic is posted every Friday and participants have all week to come up with their own illustrated interpretation. CARTOON MODERN http://cartoonmodern.blogsome.com Dedicated to the design of cartoons from the 1950s. The “Art” of Mitch O’Connell by Daniel Zimmer The 3D World of Henk Dawson by Daniel Zimmer The Comic Art of Mark Schultz by John Fleskes The Art of Nathan Jurevicius by Daniel Zimmer …and much more!